For 100 years, Wood's Homes has offered a lifeline to children and their families who have nowhere else to turn. A multiservice, non-profit children’s mental health organization based in Calgary, Wood’s Homes serves communities throughout Alberta and in the Northwest Territories. 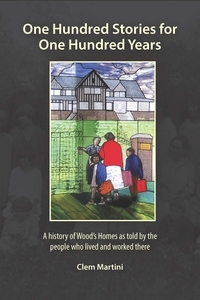 In honour of the 100th anniversary of Wood's Homes in 2014, this collection of 100 stories celebrates the deep and lasting impact the organization has had on those who have lived and worked there. The stories--sometimes quirky, sometimes raw, but always coming from the heart--also reveal the dramatic changes in the needs of young people and their communities over the last century. Clem Martini is an award winning playwright, novelist, and screenwriter with over thirty plays, and ten books of fiction and nonfiction to his credit, including the Calgary Book Award-winning Bitter Medicine: A Graphic Memoir of Mental Illness. From 1998 through 2007, he taught theatre classes to children at Wood’s Homes. He is currently a professor in the School of the Creative and Performing Arts at the University of Calgary.